Unknown D-3 Unknown An IRBM intended for Project 652 submarines. Unknown D-6 4K-18 SSNX-13 A ballistic anti-ship missile. Unknown D-7 Unknown An IRBM to replace RSM-20. Unknown D-8 Unknown Unsuccessful competitor to RSM-40. P-15 SS-N-2c Styx SSM being unloaded from the No. 4 missile tube aboard USNS Hiddensee, a Tarantul I class missile corvette. Picture taken in 1993 while USNS Hiddensee was moored at the Naval Sea Systems Command facility at Solomons Annex. U.S. Navy Photograph No. DN-SC-93-05859. OS-24 Komet AS-1 Kennel Abortive ship-launched derivative of AS-1 Kennel. Became coast defense S-1 (SSC-1). P-1A Shchuka-A SSN-1 Scrubber Radio command guidance. P-1B Shchuka-B SSN-1 Scrubber Active radar homing. P-2 Sopka SS-C-2 Salish Modified version of OS-24 installed on cruiser Dzerhinsky. P-5 Pityorka 4K-34 SSN-3 Shaddock First Soviet strategic cruise missile to enter service. P-5D Pityorka 4K-95 SSN-3 Shaddock P-5 with radio altimeter. P-5K Pityorka 4K-95D SSN-3 Shaddock improved version of P-5D. P-6 Progress 4K-48 SSN-3 Shaddock Unsuccessful early anti-ship P-5. Variable launch to fixed target. P-6D Progress 4K-48M SSN-3 Shaddock P-6 fitted with talk-back data link for in-flight course correction. P-7 Progress SSN-3 Shaddock Unsuccessful land-attack version of P-5 with variable launch to a variable target. P-7D Progress SSN-3 Shaddock P-7K retrofitted with talk-back datalink for course correction. P-7K Progress SSN-3 Shaddock P-7D with radar altimeter. P-10 Buran N/A Beriev-designed rival to P-5. P-15 Termit 4K-40 SSN-2A Styx first Soviet tactical anti-ship missile. P-15T Termit 4K-40T SSN-2A Styx IR homing version of P-15. P-15U Termit 4K-40U SSN-2B Styx P-15 with folding wings. P-15M Termit 4K-40M SSN-2C Styx P-15U with increased range and auxiliary IR seeker. P-20 Burya N/A Abortive 1960 Ilyushin ultra-long range cruise missile. P-20 Rubezh SSN-2A Styx Export version of P-15. P-20 Termit N/A Version of P-15M with new guidance system. Evolved into P-27. P-20L Ametiste SSN-7 Starbright Submarine-launched version of P-15U. May have been only for export. P-20M Rubezh SSN-2C Styx Export version of P-15M. P-20K Rubezh SSN-2C Styx P-20M reworked to P-21 standard. P-21 Termit SSN-2B Styx IR homing version of P-15U. P-21 Termit-R 4K-51 SSN-2D Styx New Radar homing version. P-22 Termit-R SSN-2D Styx IR homing system. P-25 N/A Solid fuel Chelomei-designed alternative to P-15. Placed in limited production 1961-62. P-27 Termit SSN-2D Styx Final production version of P-15 with missile electronics from P-270. P-35 Bazalt N/A Early supersonic land-attack cruise missile. Abandoned after severe development problems. P-35 Progress 3M-44 SSN-3 Shaddock Upgraded P-7 missile fitted with guidance system from P-35 Bazalt. P-35M Progress SSN-3 Shaddock Coast defense S-35 missiles adapted for naval use after fire destroyed P-35 inventory. P-40 N/A Long-range anti-ship version of P-35 Bazalt missile to arm converted Sverdlov class cruisers. P-50 Malachit SSN-9 Siren "Universal" anti-ship missiles developed for submarines and surface ships. Replaced by P-120. P-70 Ametiste 4K-66 SSN-7 Starbright Scaled down P-5 to arm Project 670A class submarines. P-80 Zubr 3M-82 SSN-22 Sunburn Hypersonic anti-ship missile arming early Pr-956 destroyers. P-100 Oniks 3K-55 SSN-22 Sunburn Encapsulated folding-fin version. Launched from 65 cm torpedo tubes on SSN's. Associated with Rim Hat FCS. P-120 Malakhit 4K-85 SSN-9 Siren Development started 1963 to replace P-50 missile. P-120E Malakhit SSN-9 Siren Export version of P-120. Offered to India but not procured. P-170 N/A Hypersonic target drone. P-270 Moskit 3M-80 SSN-22 Sunburn New generation light anti-ship missile to replace P-15. P-350 Bazalt 4K-77 SSN-12 Sandbox Successor to cancelled P-35 Bazalt started in 1963. Evolved into P-500. P-500 Bazalt 4K-80 SSN-12 Sandbox Production version of original P-350 Bazalt. P-700 Granat 3M-45 SSN-19 Shipwreck Turbojet alternative to P-500. Much more successful. P-750 Grom SSN-X-24 Scorpion Abandoned long-range cruise missile. P-800 Yakhont 3M-55 SSN-X-26 Ramjet version of P-80 Zubr. P-800 Bolid SSN-X-26 Encapsulated, submarine launched version of Yakhont. P-900 Alfa 3M-51 SSN-X-27 Version of Granat carrying hypersonic final attack stage. P-1000 Vulkan 3M-70 N/A Hypersonic heavy anti-ship missile replacing P-500 and P-700. S-10 3M-10 Granat Soviet copy of USA Tomahawk strategic cruise missile (Tomahawkski). Kh-35 Uran 3M-24 SSN-X-25 Switchblade USA Harpoon-like anti-ship missile. 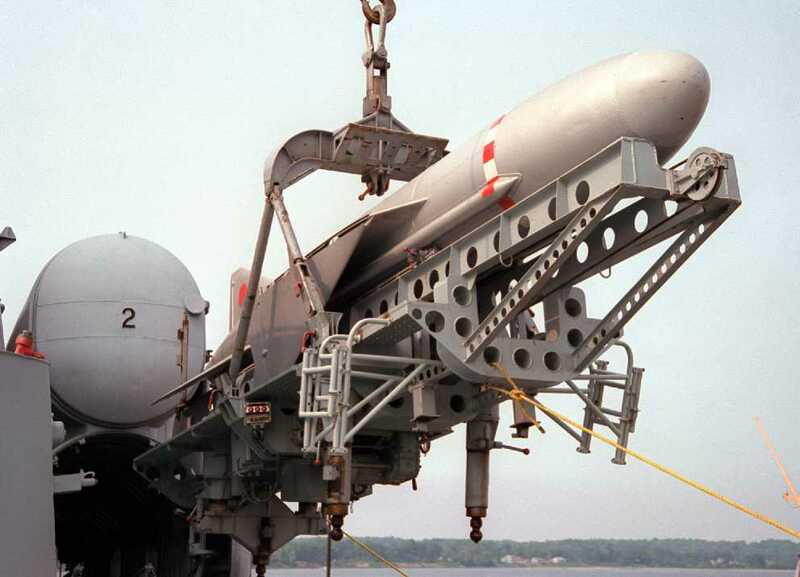 S-10 Granat 3M-10 SSN-21 Sampson Tomahawkski. V-753 Volkhov-M SAN-2 Guideline Version of land-based V-750 system intended for use in mass conversion of Pr-69bis cruisers. M-22 Uragan 3M-38 SAN-7 Gadfly Export name "Shtil". RPK-2 Viyoga SSN-15 Starfish Uses 82R torpedo or 90R nuclear depth charge missile in 53.3 cm version and 83R torpedo carrying or 86R nuclear depth charge in 65 cm version. RPK-3 Metel SSN-14 Silex Uses UPRK-3, UPRK-4 or UPK-5 missiles. RPK-4 Musson SSN-14 Silex Uses UPRK-3, UPRK-4 or UPK-5 missiles. RPK-5 Leevyen RBU-1000 Six-barrelled rocket launcher firing 89R guided depth bomb. RPK-6 Vodopod SSN-16 Stallion Surface ship system firing 82R torpedo or 90R nuclear depth charge missile in 53.3 cm version and 83R torpedo carrying or 86R nuclear depth charge in 65 cm version. RPK-7 Vodopei SSN-16 Stallion Submarine system firing 82R torpedo or 90R nuclear depth charge missile in 53.3 cm version and 83R torpedo carrying or 86R nuclear depth charge in 65 cm version. RPK-8 Zapad RBU-6000 Fires 90R guided depth bomb. RPK-9 Medvedka SSN-X-29 USA ASROC-like torpedo carrying rocket for small ships. 9P-516 SAN-10 Powered twin-rail launcher for Igla. Designation industrial. B-187 SAN-3 Shtorm launcher on Moskva. B-187A SAN-3 Shtorm launcher on Pr 1134/1134A/1134B. B-192A SAN-3 Shtorm launcher on Pr 1143. FASTA-4M SAN-5 German-designed 4-barrel launcher for Strela-2 and Strela-3. FKR-2 SSN-3 Canister launcher for P-5. KT-67 SSN-2 Open hangar launcher for P-15. KT-67B SSN-2 Closed-in hangar launchers for P-15. KT-67ER SSN-2 Cylindrical launch container for P-15U. KT-84 SSN-9 Launch container for P-120. KT-97B SSN-2 Cylindrical launch container for P-15M. KT-100 SSN-14 Quadruple tubes for Rastrub used on Pr 1134 BPKs. KT-100U SSN-14 Quadruple tubes for Rastrub used on Pr 1135 SKRs. used on Pr 1155 BPKs. KT-129 RBU-10000 10-barrelled launcher for 89-R.
KT-138 SSN-2B Launch container for P-20. KT-152M SSN-22 Encapsulated container to fire P-100 from 65 cm torpedo tube. KT-184 N/A Quadruple tubes for Kh-35 Uran. KT-190 SSN-22 Common cylinder launcher for wide variety of missiles. MS-32 FRAS-1 Twin-rail launcher for RPK-1. MTU-4B SAN-8 Four-barrel launcher for Strela-3. SM-51-1A SSN-1 Large warm-up hangar for Shchuka. SM-312 SSN-22 Launch tube for Oniks. Volna SAN-6 Eeight-round revolver launcher for S-300 and V-601. ZiF-101 N/A Twin-rail launcher for Volna. ZiF-102 N/A Twin-rail launcher for Volna. ZiF-122 SAN-4 Retractable launcher for OSA-M.